''....Risen out of the ashes of Trio Bravo, Michel Massot and Michel Debrulle picked up again their musical activities in 1993. 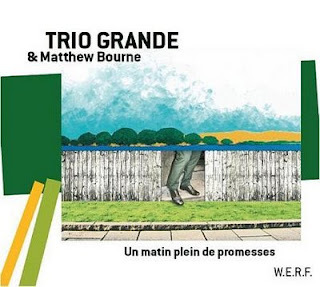 After years of concerts, creative extravagance and some marvellous releases, Laurent Dehors joined Massot and Debrulle under the name of Trio Grande. Now they will be assisted by Matthew Bourne, a talented pianist. Michel Massot is no longer a stranger in the world of jazz in Belgium. This tuba player that opens up new horizons started his career in the avant-garde jazz with Garret List and Henry Pousseur and he was part of projects such as Dreamtime by Kris Defoort, Rêve d'éléphant, Mâäk's Spirit en Tomassenko. During the projects Rêve d'éléphant and Tomassenko he met Michel Debrulle and Laurent Dehors. Dehors has French roots running through his veins and he is very active within the French avant-garde jazz and also now on Belgian soil. For their performance at the Gent Jazz Festival, Massot and Debrulle will be assisted by this multi-instrumentalist who already has a lot of experience in France as far as the work in a trio is concerned. Laurent Dehors is the drummer and takes care of the percussion. He also wrote soundtracks for several movies. He also offered his talents to some famous musicians including Michel Portal, Louis Clavis, Michel Godart, Serge Lazarevich and J.M. Pilc. Dehors is also very familiar to the world of big bands. This versatile pianist and creative soul certainly fits in the image that the duo Massot-Debrulle had in mind.